SHANGHAI: Police are investigating nine people in connection with the collapse of an under-construction residential building, the local government said yesterday. The nine people, whose names were not released, either work for the property developer, contractor, quality supervisor or the construction company involved with the project, the Minhang district government said in a statement. The 13-story apartment building, which was under construction, toppled over almost intact, killing one worker. Gao. They have been placed under "control", which means they haven't been detained but their movements have been restricted, the officials said, adding that the government also controlled the capital flow of the developer of the building. On Saturday morning, one of 11 unoccupied apartment blocks of the Lotus Riverside residential complex in east Shanghai's Minhang district fell on its side, almost intact, killing a construction worker. The 28-year-old migrant worker surnamed Xiao from Anhui province had finished his work for the day and was packing his tools when the building collapsed. Xiao's family has arrived in Shanghai to collect his body, officials said. 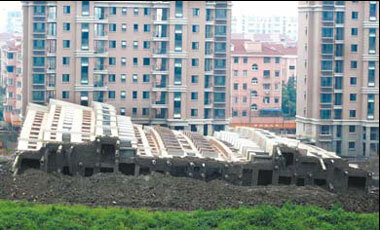 Of the 629 apartments in the residential complex 489 had already been bought before the structure collapsed. The apartments were sold at 14,300 yuan ($2,100) per sq m on average. The price had recently shot up to 18,800 yuan per sq m.
Hundreds of angry homeowners who had bought the apartments stormed the reception office of the local government on Sunday demanding a refund and compensation. Internet users found that Que Jingde, a director on the board of Shanghai Meidu Real Estate Company, the property developer, also worked for the local government. According to the official website of the Minhang district government, a person with the same name Que Jingde is the "assistant to the director of Meilong town". But It cannot be independently verified whether they are the same person. A district government spokeswoman refused to comment on the information. Fang Lei, an official of the municipal land bureau, said she "did not have information on the developer's board of directors". She, however, refuted allegations that the developer's construction license expired in 2004. "The developer's license is still effective," Fang said. As of yesterday, the details of the license or the project was not available on the bureau's website. A district government official, who would not be named, said the remaining 10 buildings in the residential complex "were found safe after an inspection" following the collapse. Xu Jianping, who owns a flat in the block next to the collapsed structure, said he yesterday received a letter from the property developer, which read that they were sorry for the accident and the inconvenience caused and that they will ensure homeowners get their due.